The best training for surfing is of course surfing. But we all know that it demands a lot from the body and can tighten-up, and close-off, specific areas. Pressure is put on the lower back, the chest closes and the hips stiffen. These specific yoga poses focus on lengthening and releasing pressure in the spine, opening the chest including torso rotation, and opening the hips to help rebalance your body. This introduction to yoga for surfing brings you the top five poses I think every surfer should learn. We will be looking at why this will help your surfing and recovery, plus how to execute these positions. However nothing beats doing it in person, the internet can only help you so much, and so we'd advise anyone to check out a local class. If in doubt, just ask Kelly Slater or Fergal Smith whether it benefits them. First things first, breathing basics – before practising these postures take a few minutes to engage with your breath. Sitting on your mat or the floor, inhale into the rib cage, expanding the chest. As you exhale draw your belly in. Focus on the breath whilst working in the postures; try not to hold your breath, move with your breath. 1. 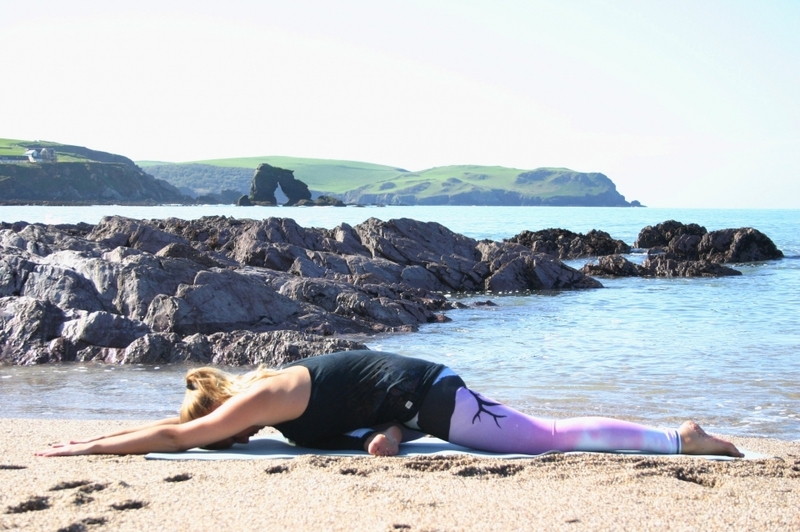 Come down to the floor onto your hands and knees, with your knees directly under your hips, hip width apart and your wrists under your shoulders, shoulder width apart. Spread your palms with your index fingers parallel and turn your toes under. 2. Take an inhale and as you exhale lift your knees off the floor. Keeping the knees slightly bent lengthen your tail bone to the sky. 3. Continue to breath, with an exhalation push your quadriceps back and reach your heels towards the ground. Feel here that the whole of the legs are active and you are able to lift the knee caps. Don’t lock your knees, if you tend to hyper-extend keep your knees a little bent. 4. Draw your focus to your arms and firm the outer arms pressing through the bases of the index fingers. 5. Allow the head and neck to stay long and follow the natural line of the spine. 6. Try to hold for a minute, breathing into the rib cage. 1. Come onto all fours with your knees directly under your hips. With your wrists shoulder width apart, walk your hands out in front of you. 2. Exhale, and push your buttocks back towards your heels, they should stop above the knees. 3. Keep your arms active and elbows lifted off the mat. Allow your forehead to come to the mat or onto a cushion/blanket/block. 4. Inhale and lift up slightly moving your hands to the left side, keeping the torso centred exhale and release back into the pose, stretching the right side of the body. Repeat with the hands to the right side. 5. Hold in centre, left and right for approximately 30 seconds, continuing to breath into the rib cage to feel the full lengthening and stretching of the pose. 1. I find this pose is easiest to enter into from Downward Facing Dog (Pose 1). 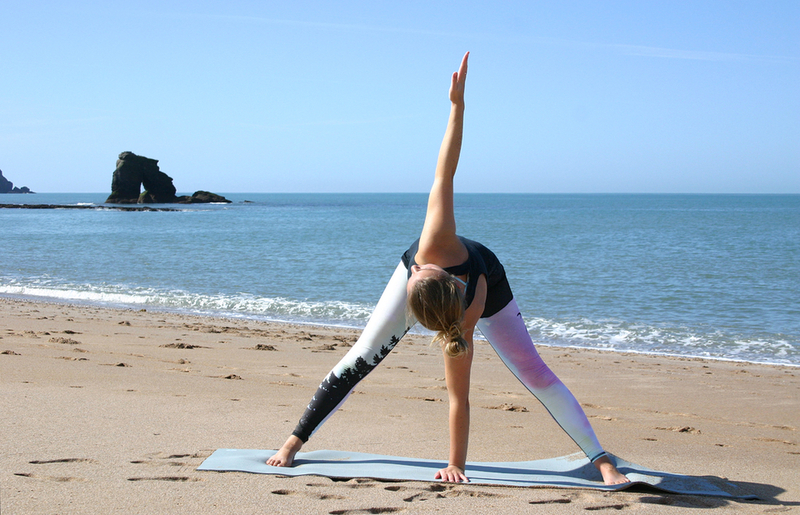 From Downward Facing Dog, draw your right knee up and in towards the chest. Release the knee in between the hands towards the right wrist. Draw your ankle out from under the body and allow your right outer shin to rest on the floor. If you have any discomfort in your knees, do not create pressure in the knee, allow the ankle to be where is comfortable for your knee. 2. Your left leg should be extended straight from the hip and lengthened backwards, feel the leg roll inward slightly. 3. Inhale lengthen the spine, sitting tall allow the chest and shoulders to open. Exhale, leading with the chest and release the torso over the bent leg extending your arms in front of you, and resting the forehead on the floor. You can also come onto your forearms or onto a block if more comfortable. 4. Inhale and slide your hands back towards your bent leg, lifting up and sitting tall. Exhale back into Downward Facing Dog. 5. Repeat on the other side; hold on each side for a good few breaths. 1. Lie on your right side, with your shoulders and knees stacked. Draw your knees up towards the body to a 45 degree angle. Take your arms out to your right side at shoulder height with the palms pressed together. 2. As you inhale lift your left arm, reaching through the fingertips, and release it to the ground on your left side. Allow your head to follow. Try to have both shoulder blades on the ground. Exhale. 3. Inhale and once again reaching through the finger tips return your left arm to join your right arm. 4. Repeat this up to 10 times, releasing and opening the chest. 5. Then extend your right leg, keeping the left knee bent over the right leg and hold it with your right hand. Inhale and extend your left arm directly up, releasing to the mat and lie the upper torso and shoulders equally on the mat. 6. Taking a good few breaths in the pose, breathing and expanding into the ribcage. Repeat from stage 1 on the left side. 1. Standing at the front of your mat, place your hands on your hips and step your feet wide apart. Align your toes and heels and make sure the edges of your feet are parallel. 2. Inhale and lengthen your torso from the crown of your head and as you exhale fold forward from the hips, bending the knees slightly. Keep your torso long. 3. Bring your hands to rest of the floor between your legs and under your chest. If your hands do not come to the floor use a block or a few books under your hands. Bring your left hand to centre, still under your chest. Inhale and extend your right arm, leading with the shoulder towards the sky. Keep your arm vertical and lengthen through the fingertips. 4: Exhale and release your arm down, inhale and with your right hand on the ground at centre, lift your left arm. 5. Ensure you twist through the torso rather than twisting through the hips, keep your hips level. Repeat 5 times on both sides. 6. Return both hands to centre. Turn your toes out and heels in slightly, squatting down. Bring your hands to your hips. Inhale and with a strong long spine lift your torso up slightly. Take your hands to rest just above your knees with the wrists facing outwards. 7. Inhale and lengthen the spine and exhale release the left shoulder forward and towards the midline of the body, twisting from the torso not the hips. Inhale lift up slightly with shoulders level and with a flat back parallel to the floor, exhale and release the right shoulder to centre. Do not let the dropped shoulder below the knee. Keep the back as flat as possible.